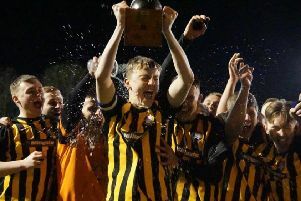 Worksop Town boss Craig Denton won’t be underestimating Thackley when they visit Sandy Lane this Saturday. The Tigers saw off the same opponents in the reverse fixture last week after an inspired second half turnaround. And Denton is aware of Thackley’s threat despite running out 3-1 winners, with just 11 days between the two meetings. He said: “We’ll train midweek, we’ll look at our shape and look and see if we have any injuries as we need to prepare for that game as it won’t be easy, we saw that Tuesday night. “With the quality that we have, when we turn it on and go on the front foot then we make it easy for ourselves and make it difficult for the opposition, so it is down to the players. “It doesn’t matter what system we play or the tactics we use; if those players want to turn it on then we will put teams to bed. Worksop go into the game on the back of a 4-1 win over Athersley Recreation, which saw all four of their goals come in the first half. Craig Mitchell got the ball rolling inside a minute, Steven McDonnell and a Kyle Jordan penalty made it 3-0 inside 11 minutes. Matthew Sykes added a fourth before the break. Denton was pleased his attackers were on the goals trail. He said: “Its great for our forwards to get on the score sheet - it’s what they get paid for. “This side is full of quality. “We’re going to create chances and our centre-forwards have put the ball into the back of the net. “People said it was dead and buried at half-time, which is hard for players when they are 4-0 up and the opposition are down to 10-men, but they need to show more resilience.